Paul's "odd couple" pairings appear to be growing more quickly as the first-term senator gets closer to 2016. So is he trying to unite the Senate, one-by-one? Or is he trying to broaden his name recognition and scope as he lays the groundwork for a likely presidential bid? Regardless, it's a risky move in today's political climate. Aligning with Democrats should theoretically be the kiss of death for a Republican 2016 hopeful who wants to rev up primary voters. While bipartisan legislative achievements look good in general elections, they can taint candidates as they try to shore up the GOP vote. Just ask Sen. Marco Rubio of Florida, whose political star fell somewhat among the Republican base after he helped pass a comprehensive immigration reform bill through the Senate last year. But Paul's work with Democrats appears to be limited and strategic: He focuses mostly on policies involving criminal justice reform and federal surveillance programs, two issues that aren't seen as hyper partisan. Serving up some red meat at the Texas GOP convention last month, Paul joked that the U.S. should trade five Democrats instead of five Taliban members in the next prisoner swap–a reference to the trade of Army Sgt. Bowe Bergdahl. 1. 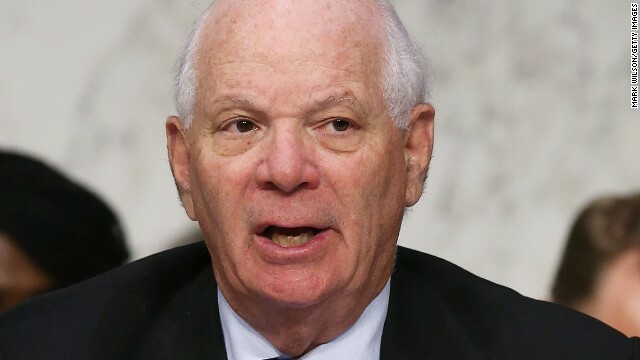 Sen. Ben Cardin of Maryland: Paul is jumping on board with an effort that Cardin has been pushing for years. The measure would give back federal voting rights to felons who are no longer incarcerated. Paul, who's actively courting support from African-Americans and other minority voters, sees this as an opportunity to set himself apart from the deluge of criticism aimed at Republicans over voting rights. "Here's a Republican who wants to enhance the vote. This is a much bigger problem than anything else limiting voting right now," Paul said last month on CNN's "State of the Union." "Nearly a million people can't vote. And I want to help people get their right to vote back." 2. Attorney General Eric Holder. Paul may be suing the Obama administration over its surveillance programs, but he's still rubbing shoulders with the government's top law enforcement officer. The two sat down for lunch in February to discuss their shared support for reforms to the criminal justice system, such as reducing or eliminating mandatory minimum sentences for nonviolent drug offenders. In addition to Paul, Holder won support from some Republican governors who view mandatory minimum laws as federal government overreach. A couple months later, the U.S. Sentencing Commission voted to reduce drug sentences for future nonviolent offenders. 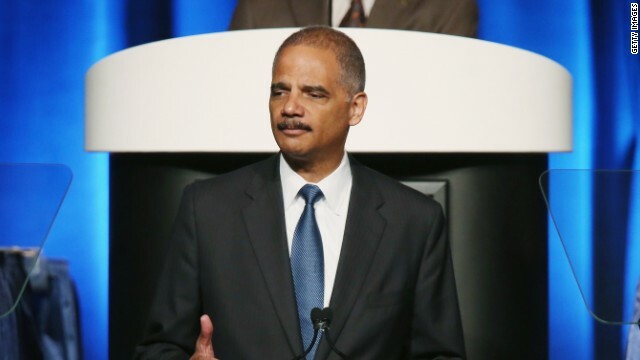 Holder is now trying to get those sentences reduced for current inmates. However, some critics say the administration is making changes without congressional action, and the changes reverse laws that many credit with historical crime rate reductions in the past decade. 3. Sen. Cory Booker of New Jersey. In another unlikely pairing, Paul is working with Booker on wider reform to the criminal justice system. 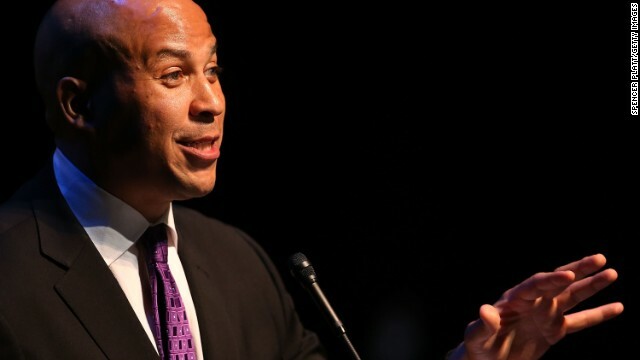 Their new proposal, known as the REDEEM Act, would allow adults to seal non-violent criminal records, encourage states to increase the age of criminal responsibility to 18, and create automatic expungement of non-violent crimes committed by kids before they turn 15. And last month the two introduced a measure that would officially ban the Justice Department from going after users of medical marijuana in states where pot is legal for medicinal purposes. 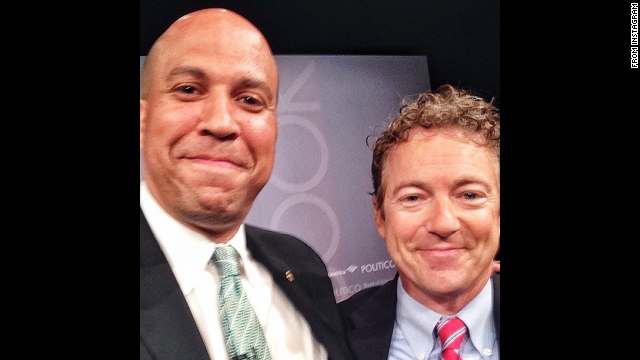 But, of course, the thing that has spurred the most attention is the selfie that Booker and Paul took together at a Politico event. The duo said their friendship began over a love of Festivus, a quirky holiday-esqe tradition popularized in an episode of "Seinfeld" that is "celebrated" on December 23 and calls for, among other things, the airing of grievances. Even though Paul came out and campaigned last year for Booker's GOP opponent, Steve Lonegan, it appears all is well between the two senators. 4. & 5. Sens. Ron Wyden of Oregon and Mark Udall of Colorado. When not tackling criminal justice reform, Paul is aggressively tweaking the government over the NSA's surveillance policy. 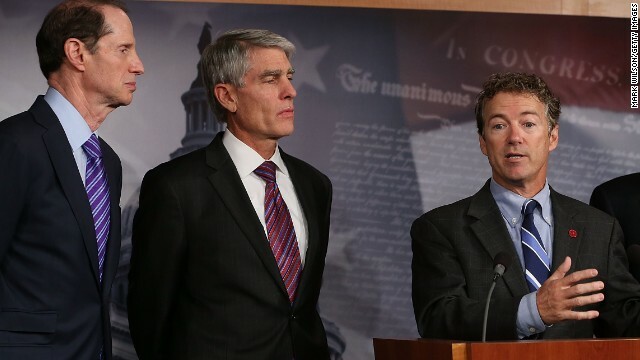 Wyden and Udall have sided with Paul as he pushes back against programs that they argue violate civil liberties. The three senators penned an op-ed together for the Los Angeles Times last month, one year after former government contractor Edward Snowden leaked some of the country's top spy secrets. 6. Senate Majority Leader Harry Reid. Perhaps the unlikeliest of them all: Paul announced on CNBC last month that he and the top Senate Democrat were proposing a tax holiday that would encourage companies to bring money home from abroad. "Senator Reid and I actually have very warm personal relations and we've been meeting informally for months, both us and staff, to try and do something good for America," Paul said. "I'm a glass-half-full kind of guy. 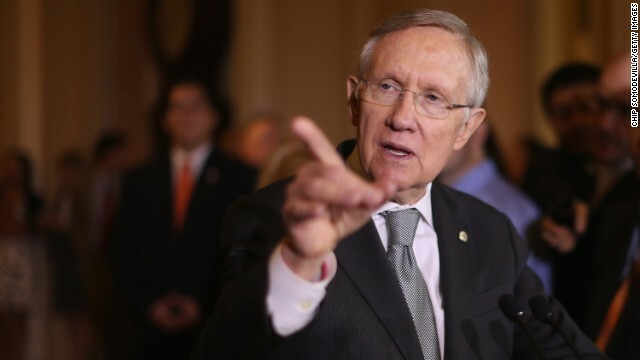 I like Harry Reid personally. I'm working hard with him," he continued. 7. Sen. Kirsten Gillibrand of New York. 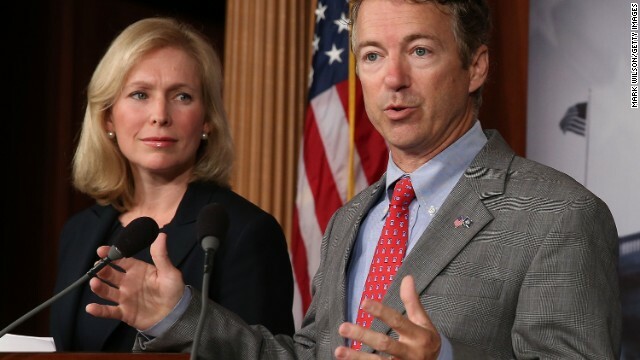 Paul has worked multiple times with Gillibrand. In January, the two–along with Wyden–introduced a measure that would repeal the President's authorization to use military force in Iraq and would officially bring the Iraq war to a close, meaning future engagements would have to be approved by Congress. And last summer, Paul joined Gillibrand and a bipartisan group of senators to advocate for a bill to combat sexual assault in the military. CNN's Evan Perez and Dana Davidsen contributed to this report. Rand Paul is doing photo ops and appearances to show he identifies with everyone. However every time he puts out a policy statement that is specific it is strict conservative. Not independent libertarian anything. Conservative. Don't be fooled. @ Chris E...al, perhaps if you remembered that our system works best when people bother to participate, as opposed to making blind partisan statements designed to prop up the weak-minded who cling to ideology like its the only truth, than you would appreciate Paul's efforts. I certainly don't agree with a lot of what he claims he is in favor of, but, if I dismiss his efforts to craft bipartisan legislation simply because of his party affiliation, I would be doing myself a disservice. Perhaps you should apply the same reasoning instead of making the same, tired, partisan comments. The fact of the matter is Rudy that some women need more than that, and if it is artfully applied no one should have a problem with it. Ah, yes. Make up. I gave it up and haven't looked back. OK ... I lie. I still need a bit of eyeliner because let's face it, I never had much to begin with. And, no. I'm NOT talking remaking lines that aren't there anymore ... ! That being said, my beef is the Uggs stuff. Both Rudy and Sniffit are on record now for giving Uggs a thumbs down. Thing is ... I wear mine while using the treadmill. It might be an age thing, eh? Just yesterday I got into an argument with some Democrat goon who insisted on ignoring Paul's amazing record of reaching across the aisle. Some people insist on perpetuating the lie, that Paul is a big meanie who hates poor people and minorities but the facts are the facts. He's doing good, but he's really not fooling anyone. I respect any woman that knows how to enhance her God-given beauty, or make the most out of herself. If full make-up gear and what-not is what she needs to be and feel confident then who am I to judge? And I won't. Me personally? I've been blessed. Ruby Woo for my lips and smudged eyeliner for my eyes is all I "need" to face the world. But to each his own." Hehe...fair enough...but note: to each his own and what folks find attractive or not is simply what they find attractive or not. Clownyface isn't really provoking a judgment of the person per se, just an "eeeew" physical reaction...much like too much blue cheese might spoil a nice steak (oh my...did I just compare women to meat?). However, I will make an exception....Uggs. I judge those people. Cankle-boots are a bridge too far. Oh indeed, bordering on Teatarded. It is hard to forget him supporting businesses serving whom they want because they were privately owned and should have that perrogative. Rand Paul is a racist. I see racists every where.... help me. "Not independent libertarian anything. Conservative. Don't be fooled." You're correct, he's not independent libertarian. At best, he's an opportunist. I doubt many are fooled by Rand Paul. Except perhaps Rand Paul himself. Which is why I'd never vote for him. Can't stand a man who can't see through his own BS and yet expects me to buy into it all the same. Luckily they're just our internet buds and don't see us in our usual get-up. If your big lug of a hub doesn't mind who are they to say?! LOL! BTW I don't own a pair, I like heels or riding boots....while I can still wear them. won't be much longer I tell 'ya! So I need to explore the Uggs option, and sooner rather than later. @Many Rivers, in response to your thoughtful post of "kick rocks", let just respond with the equally charming and mature "mange moi". Oh, and do have a pleasant evening.